I’m always looking for time savers, particularly when it comes to breakfast. Though I love chickpea omelets, especially as a break from the oatmeal I eat most days, I’m not often in the mood to measure all the seasonings I need to make them taste the way I like. So a few weeks ago, I decided to experiment with making a mix that I could fix ahead of time and keep in the fridge so I could put together an omelet any time I like. 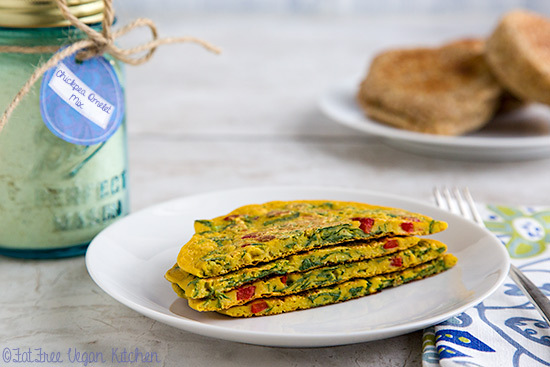 And I’ve been enjoying chickpea omelets for breakfast (and lunch) ever since! 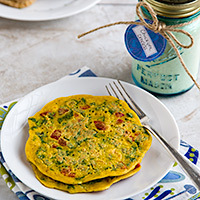 The recipe is based on my Chickpea Flour Omelets with Asparagus, but I’ve tinkered with it to get the seasonings just right–flavorful but “generic” enough that they go with whatever ingredients I choose to fill them with. Now all I have to do is mix 1/3 of a cup of the pre-made mix with 1/3 cup of water, chop a few favorite veggies, and cook them like pancakes. A bit of sriracha mayo or Roasted Red Pepper Dressing takes them from delicious to sublime. 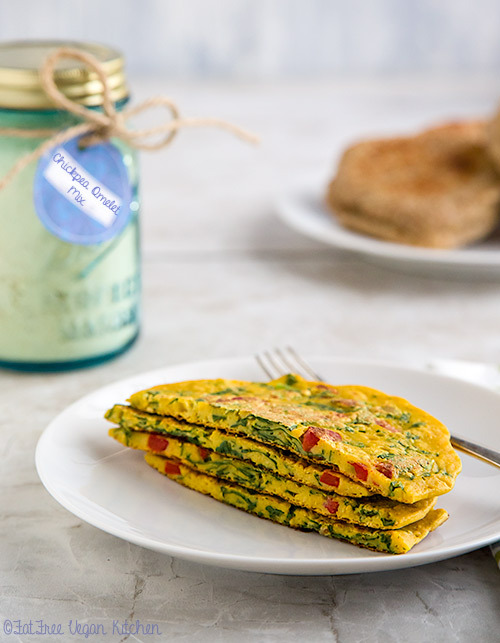 My favorite way to make these is to stir the omelet “filling” right into the batter (that’s baby kale and roasted red peppers in the photos). Almost any fast-cooking vegetable will do, as long you don’t add too much. You can also make them more like traditional omelets by folding them over a filling, but to me, that’s just more work. I like to keep things simple in the morning. So consider this my holiday gift to you: omelets any day of the week! This mix is generically seasoned, making omelets that adapt to any kind of cuisine. 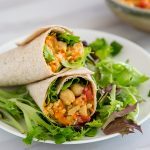 Feel free to add additional seasonings depending on your mood or the filling you use–for instance, garam masala for an Indian flavor or chili powder or chipotle for a black bean filling. Each 1/3 cup of the mix will make 2 small omelets, which I consider one serving. I don’t advise cooking it as one large omelet because it’s difficult to get the middle completely cooked. You can also make filled omelets by preparing a filling beforehand (sauted mushrooms and kale, seasoned black beans, etc.) Prepare omelet as above, adding the filling after the first side is well done and folding one side of the omelet over the filling. Cover and cook for a couple of minutes to complete cooking. 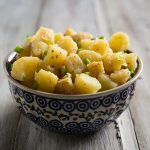 *Chickpea flour or besan and black salt can be found for low prices in Indian grocery stores, but if you can’t find them locally, you can order them online. Each serving counts as 3 Weight Watchers Freestyle Smart Points. Note: I’ve begun replacing my traditional non-stick pans with ones that are free of PTFE and PFOA. I use this moderately priced skillet to make these omelets. Hi..i made your chick pea omelet and found it quite bland..is there something that can be added for more flavor? Also how do you make yours a yellow color? As mine was a pale white colour? You can use any herbs or spices you like to increase the flavor. If by bland you mean “not spicy,” I would use chipotle powder of cayenne to increase the heat. I want to try this. Could this be baked, casserole style? Just wondering about preparing a larger quantity easily.. I wouldn’t try that with this recipe, but I have seen other chickpea frittata recipes that look bigger. I would put Mrs Dash Table Blend in mine! I use it a lot instead of salt. It’s a great all-purpose seasoning. I also would use frozen chopped onions, and frozen roasted red pepper, and frozen chopped spinach to make it easy to make the omelet – like I used to when I ate egg whites! Hi Susan, I finally made these and they are going in the lineup for breakfast. Kalamata olives, red bell pepper, onion powder, spring onion …. I would like to know what kind of non stick pan you use. I’m so glad you liked them! I have two skillets I love. One is this one by Berndes: http://amzn.to/2BjNK5H The other is a Scanpan. Both brands are excellent. Awesome recipe. Can’t wait to make it! This is a great recipe and a time-saver in the morning.. I use frozen chopped spinach for added convenience and it’s delicious. Thank you! I just made this for the first this this morning, and it was so much tastier than I thought it would be… I just added some garlic powder, sauteed onions, fresh spinache and some vegan cheddar cheese…. I could only eat one, so the other one is in the fridge, hoping it keeps until the wife comes home. One change I did is instead of 1/3 cup water, I used veggie broth for added flavor. This mix is going with me camping this weekend! I love this recipe! I actually use them as a savory crepe and my favorite filling to roll up in them is a spinach dip and butternut squash mixture I make. Love having this on hand in the fridge ready to go at a moment’s notice. Thanks! Your waffle tofu recipe sounds yum! I shall try it but I do have to order a waffle iron. 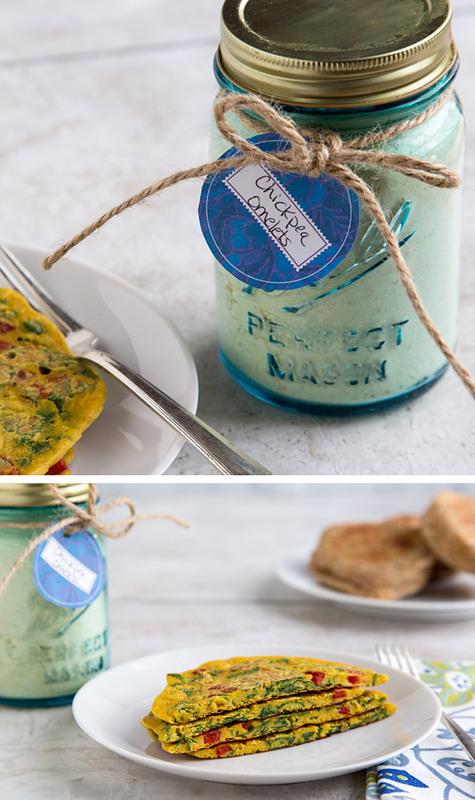 Have you considered selling your Chickpea omelet mix? I would for sure buy it! Your omelets I’d like to try as well as they look delicious (!!) but it would be a challenge to find the products where I currently live as it is mostly a carnivore town. and I’ve had to become quite creative with what little is available and cook all my meals whereas in Hawaii and So Ca where I lived, vegan products and stores abound. Whole Foods store where I shop doesn’t even have a veggie burger on their deli menu. I suppose it’s all about demographics. I look forward to your postings and recipes. Pls let me know if you would consider selling our Chickpea omelet mix. this recipe is bunk to me. i cooked it on the stove for SO LONG and it only was so crispy on the outside and wet and gloopy and disgusting on the inside. so frustrating. It sounds like the batter may have been too thick. For anyone else reading this, add extra water if your batter seems too thick. Hello…your recipe sounds great however due to health reasons I cannot have Nutritional yeast…any sub suggestions? TIA. Thanks for the recipe. I am about to make some up. I wonder how it would work with a waffle iron. (Adjusting water for consistency, as needed.) What do you think? My only worry is that it may stick to the waffle iron. Good luck! Love it! Perfect recipe! I must admit that I have fried mine with some oil, so it was heavenly! My husband has been missing omelets so I decided to give this a try. I sautéed chopped onions, green peppers & roasted red peppers, then covered the vegetables with the batter. Melted vegan cheese and served with roasted potatoes/sweet potatoes. He loved it. This works as perfect vehicle for lots of veggies. I’ll add kalamata olives and mushrooms next time! Thank you! He was getting tired of soups! 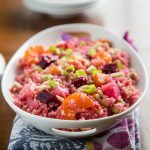 This recipe is so easy and so delicious! I love making omelettes with whatever veggies I have laying around. Flavor-wise these are absolutely delicious!!! a added sauteed onion and a chopped spinach/kale spinach kale mix that I buy frozen from BJ’s – cooked first and added right into the batter….mmmmmm. I do find them delicate though, challenging to flip!! i used sprouted chickpea flour so I bet this is the difference? It may be the sprouted flour. I’ve never used it. Glad you liked the flavor, though! If I don’t have superfine chickpea flour, do you think regular chickpea flour would work as well? I’ve found it a little gritty. If you look at it and see chunks of chickpeas instead of flour, I wouldn’t use it for this. But if it looks smooth, it should be ok. You can also try sifting it. Thanks Susan! I’ll try sifting first! Hi, Just wondered if you can leave out the flax seed or replace it with chia seed (maybe ground?) Would like to try this but I can’t eat flax seed. Yes, chia seed will work just as well. Hope you enjoy it! 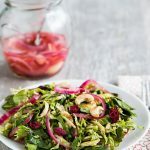 Is it okay to omit the flaxseed and black salt? Also, how many grams is 1/3 cup of the mix? I use Metrics. Finally, is it okay to keep the dry mix at room temperature, instead of in the fridge? I have limited fridge space as I share a house.